I have yet to travel to the Rungis market, but I do plan to attend it eventually, whether it is with my new work at Formaggio Kitchen, or of my own drive, which the two often seem one and the same. What is the Rungis market? Well, let me quote Lynn Miller, the editor of Small Farmers Journal. In his article, to market to market to buy a fat pig, Lynn speaks of how the propagation of diversified markets will ensure a better path for all small farmers, and may I add, small entrepreneurs of all types. I believe this law can be said about not only the food industry. I see so many similarities between all products of industry that are appearing out of the homes of so many talented individuals. Those crafts should not be suppressed within industry, they should be promoted! I say these things as a strong individualist with a keen focus on empowerment. More businesses should be run off partnerships between MEN AND WOMEN OF INDUSTRY, INDEPENDENT ENTITIES LIVING SIDE BY SIDE. To me that is the true definition of freedom. “One thousand years ago a farmer’s market was established for the city of Paris. Today it is known as the Rungis International Food Market. Huge, bustling, modernized and archaic (when measured against the corporate world), it spreads out today to exceed the landmass of the principality Monaco! Up until 1969 it operated out of the heart of the great city of Paris and was fondly known as Les Halles. Today, out of necessity of scale, it is 4 miles outside of the city near the village of Rungis and includes its own beltway, railway, banks, hotels, car rental stations and truck repair shop. It is its own city- a city that lives at night. Even extending to its more recent digs, Les Halles/Rungis has for ten centuries been the belly of France- the driving force behind one of the most dramatically epicurean societies in history. Rungis is not a thing in and of itself, it is a thing in the aggregate-and that is a critically important distinction. Here is an example of how many independent produce and market ventures have come together with an economic vitality that has arguably shaped an entire nation to beautiful advantage. Rungis is a fresh market, first and foremost. At 2am buyers arrive in droves to select- from acres of giant, connecting halls-meeats and cheeses, fruits, vegetables and flowers. 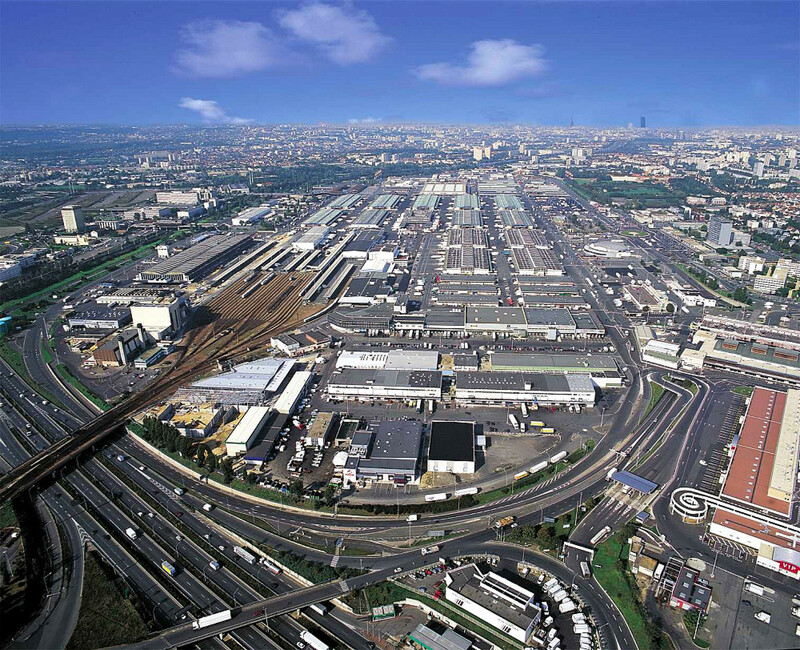 Rungis feeds 11 million people in Paris region every day, as well as supplying markets and restaurants around the world. Eleven million! Can you imagine having a discussion of how to limit the number of farmers delivering produce to Rungis so as to hold prices steady? Unthinkable. Have prices swayed? Of course they have. Does everyone benefit from the market being truly free and open? You bet they do. Rungis market is big, very big. And some might observe, too big. But it is not the only farm produce market bazaar. Others, much smaller, serve neighborhoods, and these in turn feed off the success of all the others, big and small. Overlapping concentric circles, small markets, medium sized markets and big markets. All of it is about economic vitality and the intrinsic independence of millions of healthy small farm ventures. Recently, in various us metropolises, the underground farmers markets by forageSF have taken storm. Everyone is coming out of their homes to participate in sharing their food culture, and nourishing the surrounding communities with their wares. By providing these spaces, we also provide ourselves with a standard of excellence within food production that comes from the people by the people. The more diversity we have within production, the higher that standard becomes and more people expect quality. The middle class is the paradigm and we have the power to shift that paradigm by our day to day actions. That power of the people is there whether we are fully conscious of it or not. It is omnipresent! The main point is to create consciousness with the way we act each day. WITH INTENTION. This is hardly political, it is about mindfulness and thinking opportunistically. If you can write the formulas for how you get food on your table, or clothes on your body, or the fuel in your car, then you are a savvy consumer soon to be entrepreneur, with each purchase an investment. Perhaps the pure pleasure of the apple dissipates for awhile, your day to day consumption becoming a well of anxiety about sourcing and wastefulness. But, when your neighbor ripens her own apple and bakes you a pie, the result then becomes TRANSFORMATIVE. You can taste the difference. I believe the French have a fabulous mix of elitism ideals with socialist principles-minus the racism and colonial influences. That is why for so long the French have been revered for their food and culture, and studied by all other countries. Mind you, not many cultures have succeeded in infiltrating and dissipating their diversified culture, although the strength of globalism knows NO TRUE COMPETITION. That is everywhere. French President Charles de Gaulle in the difficult years of the 1960s said, “How can you govern a country that has 246 different cheeses?” Actually there are over 500 different cheeses! This statement of governance difficulty may be true from a regulatory standpoint, but it also shows an exasperation of this president: his lack of knowledge of the people and their industry, and, therefore, a lack of power and ability to govern. The more social context we are aware of, the more value and information we will receive. Our contextual and communal expertise will grow, and education will be at the forefront of creating new laws to live, govern, and teach by. Globalism is beginning to set the standard for the world and with this comes global knowledge and wisdom trickling into our collective consciousness. The marketing squad will try to own those cultural concepts in our minds, but we must remember how to listen to our inner voice of expression, with the industry of markets at our fingertips, in our minds, and inescapably connected to our hearts.